The activation of classical αβ T cells is initiated when the T cell receptor (TCR) recognizes peptide antigens presented by major histocompatibility complex (pMHC) molecules. This recognition always occurs at the junction of a T cell and antigen-presenting cell (APC). 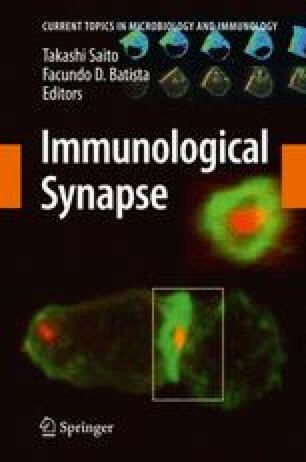 Existing models of T-cell activation accurately explain the sensitivity and selectivity of antigen recognition within the immunological synapse. However, these models have not fully incorporated the diverse microcluster types revealed by current imaging technologies. It is increasingly clear that a better understanding of T-cell activation will require an appreciation of the diverse signaling assemblies arising within the immune synapse, the interrelationships between these structures, and the mechanisms by which underlying cytoskeletal systems govern their assembly and fate. Here, we will provide a brief framework for understanding these issues, review our contributions to current knowledge, and provide perspectives on the future of this rapidly advancing field. S.C.B. was supported by an American Heart Association Scientist Development Grant, by an award from the Dana Foundation for Brain and Immuno-Imaging, and by the NIH (R01 AI076575-01A1).